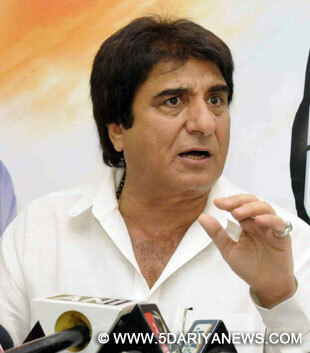 Congress's Uttar Pradesh Chief Raj Babbar has said that his party's main agenda in the upcoming UP assembly elections is corruption, and not a fight against any political parties.In an interview with ETV News Channel, Babbar said: "Congress is not fighting Bharatiya Janata Party (BJP), Samajwadi Party (SP) or Bahujan Samaj Party (BSP). It is fighting against corruption. "He said the BSP has lost public support and Mayawati's close aides are quitting the party. He criticised BJP for their politics in Dadri, Muzaffarnagar and Kairana, where the party was accused of fuelling communal violence.On Shiela Dikshit being projected as the chief ministerial candidate for UP, Babbar said the people have seen her work in Delhi, and they will benefit from her experience. On being asked whether the Congress will form any alliance in the upcoming elections, Babbar replied that the Congress's only alliance was with the public.Babbar also affirmed that Priyanka Gandhi will campaign for the party during the UP polls as he has appealed to her in this regard.Babbar addressed Samajwadi Party chief Mulayam Singh Yadav as his political 'Guru' (teacher) and denied any differences with his family. However, he came down heavily on UP Chief Minister Akhilesh Yadav saying: "He is a nice person, but not a good Chief Minister."